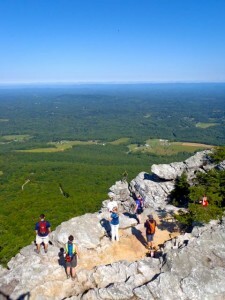 Get Hiking with GetGoingNC and Great Outdoor Provision Co. - GetGoing NC! Today, I’m adding a twist. When it comes to hiking, instead of telling, I’m going to start showing. I’m going to make you a map, meet you at the trailhead and start going out in the woods with you. GetHiking! is a 12-week program we’re launching in partnership with Great Outdoor Provision Co. Starting Sept. 14, I’ll be leading guided hikes on local trails. We’ll start with short hikes and gradually incorporate longer trips. We’ll throw in some mid-week hikes, some after work, some before some under the lights. The program is for novice hikers who need a little encouragement and direction, as well as more seasoned hikers interested in discovering more trails. You can learn more about the program at the Great Outdoor Provision Co. blog, where we’ll be unveiling details about GetHiking! throughout August. You can also learn more about the program under “GetHiking!” in the left rail of our home page. We’ll have a kickoff event at Great Outdoor Provision Co’s Cameron Village store on Thursday, Sept. 12. Our first hike is Saturday, Sept. 14. We’re also offering a corporate wellness version of GetHiking! Want to introduce your employees to a healthy, vigorous activity they can take with them the rest of their lives? Let GetHiking! tell you why you should launch a hiking program. You’ll find more about this aspect of our program here. So check out the Great Outdoor Provision Co. blog today. And plan to join us on the trail this fall.